Hi there crafty people, so how’s your week been? Well, it’s Friday again – how quickly is time whizzing by now! Today I’m sharing some more Christmas cards – yes I know they seem to be on every post at the mo, but after I’ve finished mine I then have to start on the one’s that my Mum wants and Sister! I hope they haven’t got a huge list this year!!! Anyway, how could anyone resist these cute little characters?! These stamps are from a set called Best Christmas from Clearly Besotted. They are little balloons that you can also snip the little tie off at the bottom so that they don’t look like a balloon! I have made these for my children’s teachers and teaching assistants – aren’t they sweet?! I’m not sure if you can really see Rudolph’s nose but it’s very shiny thanks to some Glossy Accents! 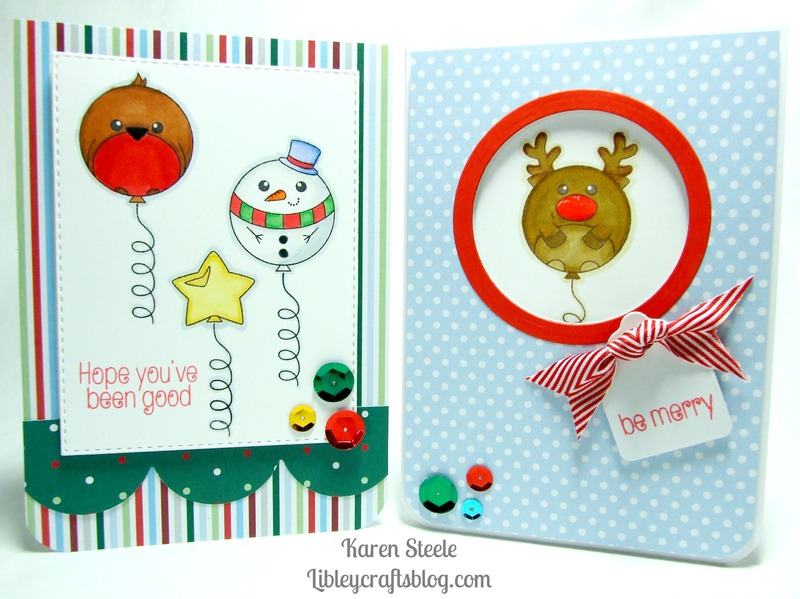 I used papers by Papermania Capsule Collection – Festive Spots and Stripes, Spellbinders circle and tag die, Sizzix Scalloped Border Die, Memory Box Stitched Rectangle Die, twine, ribbon, sequins and Glossy Accents. < Previous In the meadow we can build…. These are adorable. I love the soft colors and all the round-y bits. You are being super productive! Thanks Keren 🙂 It starts off quite well but I’m sure it will all go to pot at some point! So pretty! I love the light blue you added. It makes them look so fresh. Nicely done!